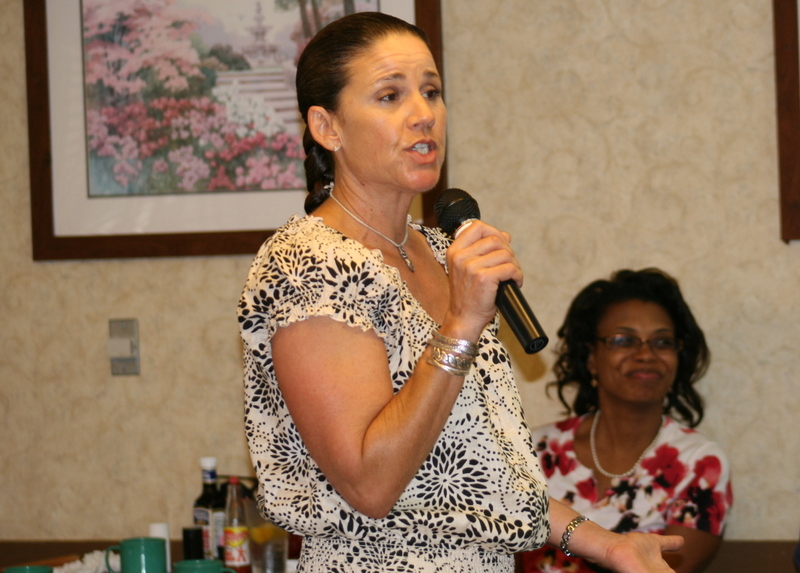 Susan Ramos, Community Rep speaks about donating blood as Executive District Director Pauline Simmonds-Brown looks on. Members and friends of the Greater Zephyrhills Chamber of Commerce gathered to exchange business cards and enjoy a breakfast at the Golden Corral in Zephyrhills on Thursday, July 28th. The monthly sponsor was Bloodnet USA based in Lakeland which is now part of the Florida Blood Services(FBS) family. Community Relations Rep Susan Ramos did a brief presentation about the blood bank and took a variety of questions from those in attendance. Pauline Simmonds-Brown, Executive District Director also helped in answering some of the questions. Door prizes were provided by Bloodnet and a 50/50 drawing was held. In this area Bloodnet USA supplies all of the blood for patients at Florida Hospital Zephyrhills and Pasco Regional Medical Center in Dade City. Be on the lookout for bloodmobiles in the area as many donors are away for the summer months and schools have not yet returned from their long break. Bloodnet has an office in front of the Florida Medical Center Complex at 38040 Market Square Drive in Zephyrhills. To find out more about donating blood go to www.bloodnetusa.org or call 1-800-683-8355. Remember, one donation can save 3 lives! !